You only have to look at the folklore and mythologies of different groups to see the crucial role that animals play in shaping cultural and spiritual beliefs. 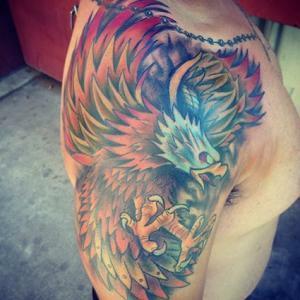 It is no surprise, therefore, that animal depictions remain one of the most popular tattoo designs. Often revered, sometimes sacred, various animals represent different virtues and have symbolic significance that is directly-influenced by a particular culture or as an amalgamation of global beliefs. Characterized by bold colors and thick lines, the different animals often depicted in traditional American style tattoos have meanings deeply rooted in sailor culture. They have endured as symbols of good fortune and perseverance. Renowned for their faithful annual return to San Juan Capistrano, the swallow was considered a good omen for a sailor's safe passage. Earning his swallows after 5,000 miles at sea, a sailor donned these protective tattoos to ensure his soul would be carried home to heaven if he died at sea. A largely popular modern design, the swallow symbolizes resilience, freedom, and a safe journey through life. Always depicted as coiled with fangs bared and ready to strike, the snake is a source of power, might, and fortification. 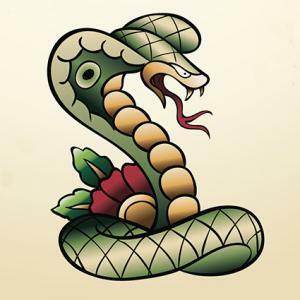 As a protective tattoo, the snake is believed to lend its wearer invincibility against evil, misfortune or violence. Strong, fierce, and unwavering in conviction, the eagle is the quintessential symbol of patriotism and freedom. Once worn exclusively by military personnel, the Traditional American eagle is now worn by any American wishing to display allegiance to the United States. Often surviving shipwrecks due to the buoyancy of the wooden cages, the pig and rooster found their way into sailor folklore and tattoo culture. A sailor who had a pig tattooed on the top of his left foot and a rooster on his right foot was considered to be protected against drowning. Symbols of good luck and staying afloat through life's tribulations, the pig and rooster can now be found atop the feet of many shore-bound individuals hoping for good fortune. Dating back to 5,000 B.C., traditional Japanese tattoos, or Irezumi, are extensive pieces that cover large areas of the body and depict nature scenes beset by the opposing elements of fire and water. Uniting Japanese and Chinese mythologies, traditional Japanese tattooing venerates the sacred nature of certain animals. Spreading far beyond the islands of Japan, this beautiful style of tattooing can be found on collectors from around the globe. The animals depicted in traditional Japanese tattoos have different meanings, all of which are culturally-based. Unlike their Western counterparts, dragons portrayed in Japanese art represent wisdom, altruism, and benevolence towards mankind. More closely linked to water than fire, dragon tattoos are symbolic of the wearer's aspiration to the virtues of wisdom, strength, and compassion. Although originating in China, the koi fish is revered in Japanese culture for its strength and infallible courage. 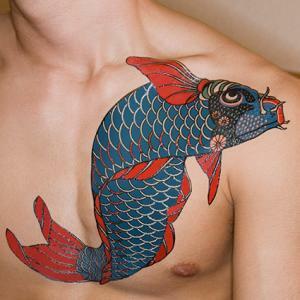 Depicted as swimming upstream, the koi symbolizes strength of character, determination, and resilience. 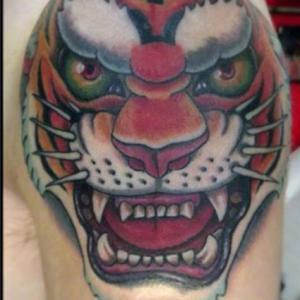 While not native to Japan, tigers play a prominent role in Asian symbolic imagery and are often depicted in traditional Irezumi. The fabled guardians of the wind, tigers represent courage, strength and protect against disease. There are countless popular animal tattoo designs derived from an assimilation of numerous global cultural influences. The symbolism attached to various animals is often derived from the traits characteristic of each creature, Native American spiritual beliefs, and elements of different world religions. 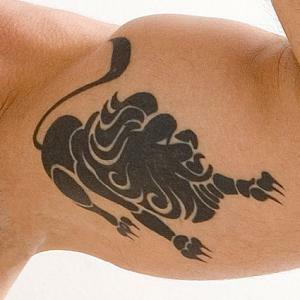 Although the meanings may not trace back to a single origin, and the style in which the animal is portrayed may differ, popular animal tattoos are often associated with the following meanings. Known for their smart, inquisitive, and friendly nature, dolphins can dive into the mysterious ocean depths and surface to interact with their human companions. 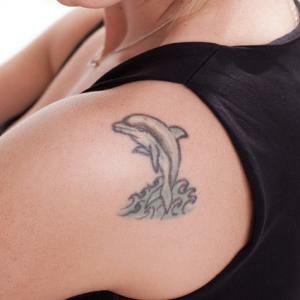 A symbol of transcendence and grace, dolphins are one of the most common animal tattoo designs. 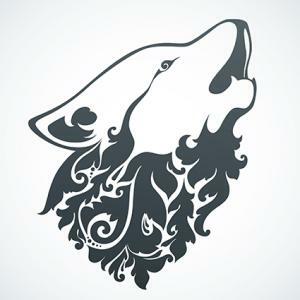 A symbol deeply entrenched in Native American culture, the wolf is often regarded as a spiritual guide representing a link to our ancestors in the afterworld. A guiding force through the perils of mortal life and marked by loyalty, fierceness, and instinct, the wolf often serves as a protective symbol. Undergoing an astonishing transformation from a flightless creature to one with colorful wings, the butterfly represents positive change, metamorphosis, and the freedom of realizing a person's figurative wings. A prominent figure in many family crests, the lion represents courage, determination, and strength. Known for traveling as part of a pride, lions stand for fidelity and loyalty to one's family and community. Choosing which animal most closely aligns with the character traits you value is a choice rooted in a personal sense of integrity and moral code. Generally, there is no right or wrong meaning associated with a particular animal when worn as a tattoo. However, if you're portraying an animal in a style characteristic of a distinctive stylistic school or tattoo culture, you should know the meanings attached to it. If you wish to remain true to a specific style of tattooing, you should seek a tattooer who is skilled in both the design subtle nuances of meaning associated with positioning and color.